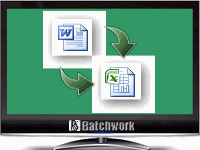 Batch Word to Excel Converter Word to XLS, DOC/DOCX to XLS Batch Converter. Word to XLS, DOC/DOCX to XLS Batch Converter publish Word DOC to XLS format. Batch DOC TO XLS Converter supports project and command line. Batch DOC TO XLS Converter has a friendly GUI so it is used very easily. Batch DOC TO XLS Converter Drag and Explorer Context supported.